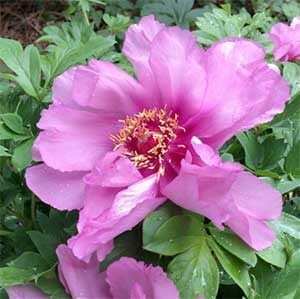 What we call the Itoh Peonies are a hybrid between tree peonies and herbaceous peonies. They are named after Dr. Toichi Itoh, and he commenced the first hybridisation trials in 1944. Thought to be impossible, Dr Itoh finally succeeded and the business has now been taken over by his son. It is only over the past 10 years that they have become widely available for sale. Breeders in the United States and indeed across the world are now producing spectacular new varieties. 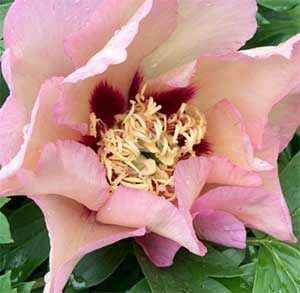 Itoh peonies are also known as intersectional peonies, and the plants and flowers take characteristics from both the tree and herbaceous types. With strong flower stems and large flowers a mature plant produces masses of flowers. The flowers can reach can reach to nearly 25cm across (10 inches) and they are as easy care as the herbaceous types. In a sunny position and a well drained soil Itoh peonies will grow well. Drainage is important, especially over winter to prevent the roots from developing fungal problems or rot. Planting Itoh types is easy. The best time to plant these wonderful peonies is in Autumn. It is better not to disturb the root system in spring or summer. Dig the soil over well before planting adding some well rotted compost and some agricultural lime, (NOT Dolomite Lime). The hole should be twice the diameter of the pot to allow for good root growth. Plant your Itoh Peony at the same depth it was in the container. Mulch lightly around the plant (not over it) and ensure that in spring, as new shoots begin to show that the plant gets some moisture. Moisture during the period of bud development help ensure bigger flowers. Fertilise twice a year with a cup of lime and a cup or two of pelletised chicken fertiliser or cow manure. This can be done in autumn and again in late spring g to early summer. After the foliage dies back its time to prune the plant back just above ground level. The buds for next years flowers will be underground, although a few buds may be seen low down on the stems. In very cold climates you can much over the plant in winter for protection, however the mulch should be removed early the next spring. All pruned materials should be destroyed to prevent possibility of disease. Flowers in the first year may be a little disappointing, however by year 3, you will have beautiful flowers and an established, easy care plant.